Become a Master Sushi Connoisseur in Sushi Go! Sushi Go! ($4.99) by Michael Busheikin of Lummox Labs in collaboration with GameWright is the mobile adaptation of the fast-paced card game of the same name. 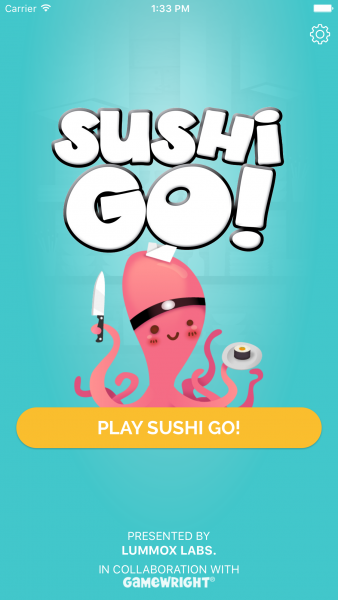 If you love quirky card games, such as Exploding Kittens, as well as a fine meal of raw fish and Japanese cuisine, then you will also enjoy what Sushi Go! brings to the table. Just watch out for those sudden cravings for nigiri and sashimi. I don’t remember exactly when I got into sushi, but I believe it was at some point during my high school years, as this was when I began to get into Japanese culture with anime, manga, and cuisine. Ever since then (over a decade ago), sushi and sashimi have become one of my favorite foods ever, and I can never pass up an opportunity to get sushi. Another love I developed over the years was for card games, because there’s something about the rewarding experience of outwitting your opponents. The only problem is the fact that there are so many new board and card games that come out physically, I don’t usually keep track of them. So I have never heard of Sushi Go! 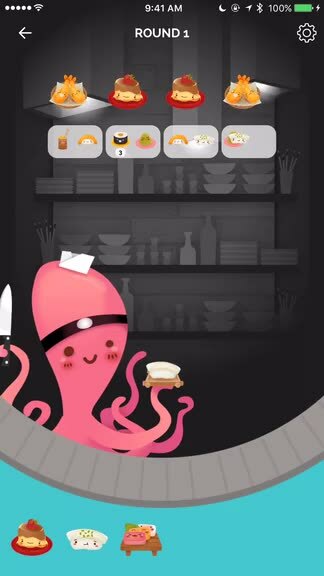 until I saw it on the App Store over the weekend, and I must say, this is definitely one you don’t want to pass up, especially if you like sushi and cute things. Visually, Sushi Go! is one of the most adorable card games I’ve come across. 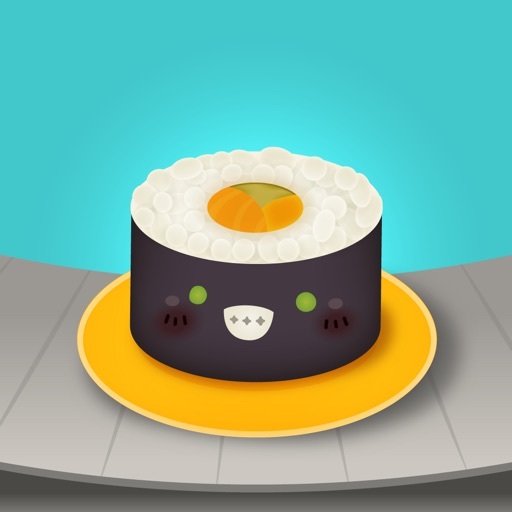 This digital version of the game takes the original artwork from the physical cards and brings them to life, as each piece of sushi, wasabi, and even pudding seems to have their own happy, bouncy personality. Even the player avatars have their own distinctive charm to them, as you have the snooty sushi snob, the hipster who tries too hard, the serious Japanese cuisine eater, and more. While the graphics are bubbly and endearing, the game still retains a rather simple and clean minimalistic design overall. The colors are bright and vivid, the sans serif text is incredibly legible, and animations are smooth and fluid. There is a whimsical little soundtrack that plays in the background (off by default, but you can toggle it in game settings), and the game has fun and delightful sound effects as you play, such as the “whooshing.” I may not have played the original physical card game, but this digital version looks and sounds good, that’s for sure. There are two ways to play Sushi Go! on mobile: Quick Start or online multiplayer through Game Center (or through Messages starting in iOS 10). Quick Start lets you play against up to four other AI opponents, as the game is designed for two to five players. 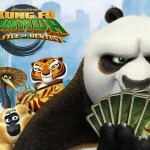 You can also invite up to four other friends for the online play, or get auto-matched with random people. Regardless of how you want to play, the objective of Sushi Go! is simple: get the best combination of sushi dishes as they whiz by on the conveyor belt. There are three rounds in each game, and the rounds last until there is no longer any more sushi to collect. As a card game, everything is turn-based, so you can take your time picking out what you think are the best sushi dishes to rack up the points at the end of the round. Once you and the other players have made your choices, the conveyor belt comes back around with another heaping of sushi for you to pick from, but it is reduced by one for each turn that has passed. Controls in Sushi Go! are as simple as they come. At the start of the round, you may have a wide plethora of sushi to choose from on the belt — if you need to see more, just swipe horizontally along the belt to scroll. You can tap on the sushi to view detailed card information, and there’s a button to take that particular piece if you so choose. 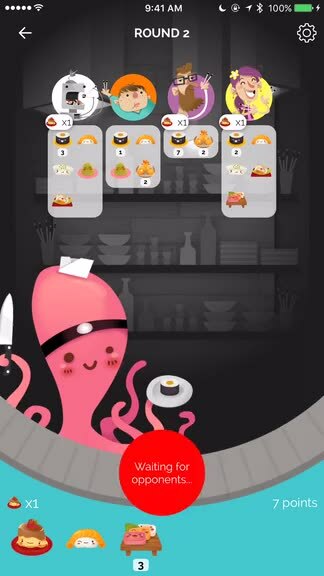 But even while you’re viewing a card’s description, you can scroll horizontally to view the details for each of the other sushi dishes available for picking. Once you’re familiar with the scoring for each card, and you prefer to speed things up, you can toggle the 1-Tap to Play option in the game’s menu. It’s important to read the description of each sushi dish card so you understand how the scoring system works, since each one is worth a different amount, and some require a pair or set of three to get credit. For example, the egg nigiri is worth one point, salmon nigiri is two points, and squid nigiri is a whopping three points. But if you take a wasabi card before getting a nigiri, you can use the wasabi to triple the value of your next nigiri card, so they become worth three, six, and nine points, respectively. Tempura is worth five points, but only if you are able to get a pair of them, as they’re worthless otherwise. 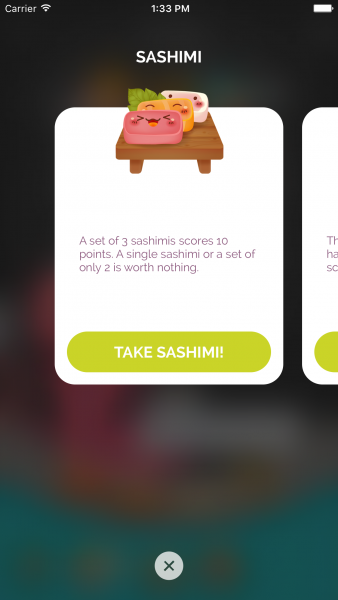 Sashimi is worth 10 points, but only if you can get a set of three. If you can get the most Maki rolls in a round, you’ll get extra points. 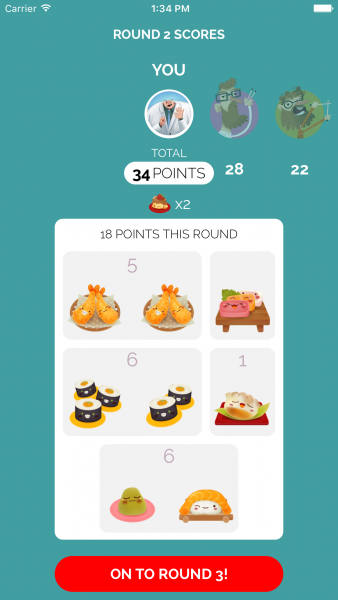 The more dumpling sushi you have, the more points you get (the sequence goes from 1, 3, 6, 10, or 15). There’s also pudding dishes, which are important and can make or break your score — the player with the most puddings by the end of the game gets six bonus points, while the player(s) with the least amount of puddings lose six points (divided among the players if there’s a tie for least puddings). While this seems like a lot to take in (it felt like that for me at first), the game is relatively simple and it’s not hard to remember how many points each dish is worth after a few games. Another thing to note is that while it is usually in your best interest to look out for dishes that benefit you, there’s also the fact that you can see what everyone else has after the turn, so you can use this to your advantage. If you see someone needing just one more tempura or sashimi dish to complete their set, you can take a tempura or sashimi for yourself to disrupt their flow. For such a simple little game, there is definitely a bit of strategy and planning involved if you want to become a real sushi master. I’ve been playing Sushi Go! regularly since I downloaded the game last week, and I can certainly say that this is one that’s tough to put down. 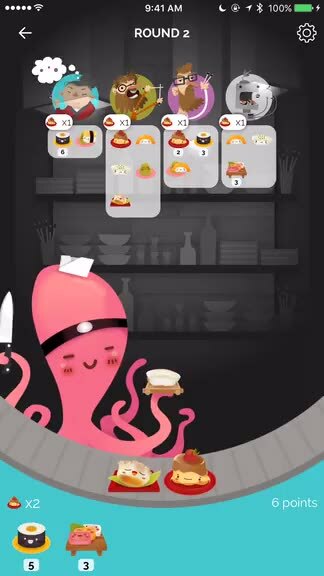 Each game does not last too long, so it’s great to play in short bursts throughout the day, and the visuals are just delightful (sushi has never looked cuter). It does not take long to get accustomed to the rules and scoring system, and there’s a surprising amount of depth and strategy involved with the game, so it will leave you hooked. The only negative thing is the fact that I’m now craving sushi more than ever, so I am sure that my wallet will take a hit if I keep satisfying those sushi cravings. 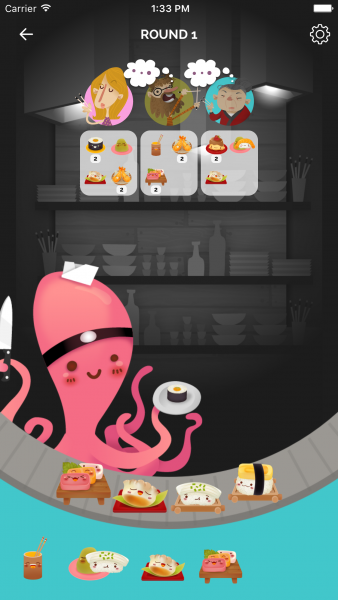 I highly recommend checking out Sushi Go! if you like sushi and card games. Sushi Go! 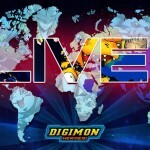 is available on the App Store as a universal download for your iPhone and iPad for just $4.99. There are no in-app purchases.